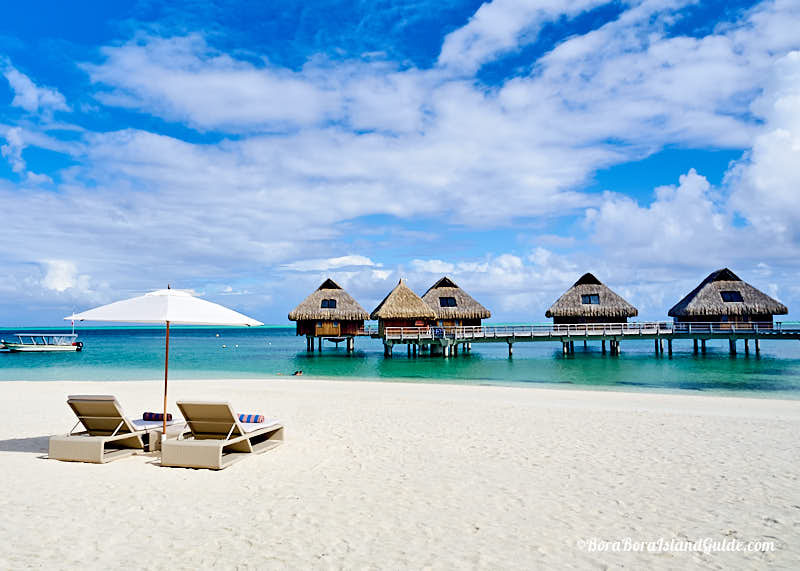 There are superb family friendly hotels in Bora Bora to chose from, if you're thinking of going to Bora Bora with kids. 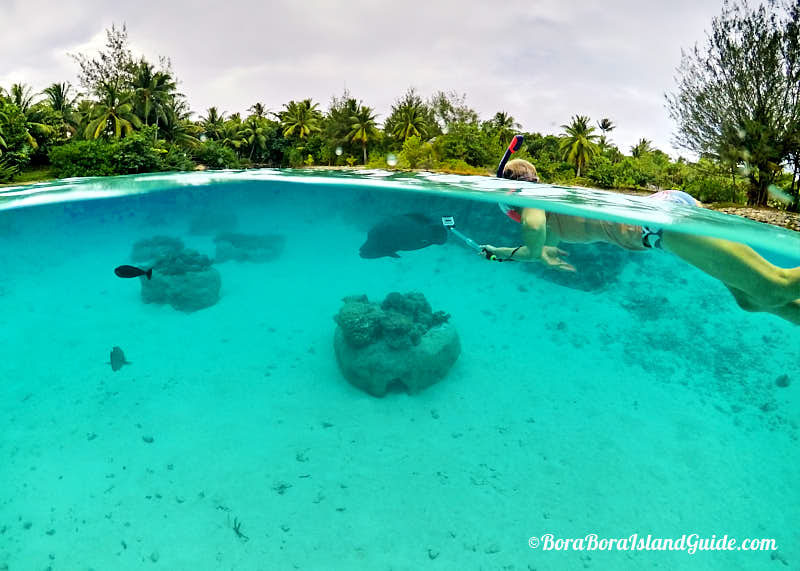 Although Bora Bora is usually depicted as a romantic, couples destination, you can have an exceptional Bora Bora family vacation too. Four Seasons has a history of being one of the most family friendly hotels in Bora Bora. Those who have already stayed at a Four Seasons hotel will know that family friendliness is not just a marketing concept, it's evident all around. 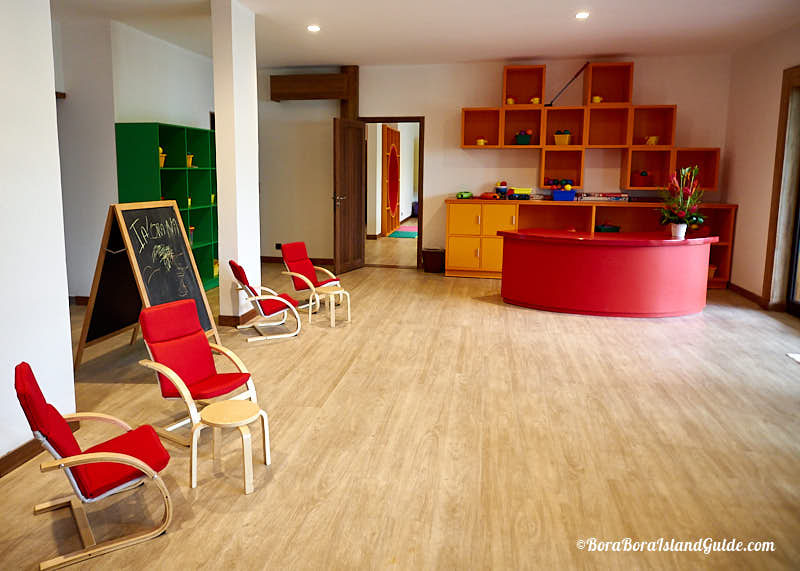 The Bora Bora Four Seasons resort takes pride in having it's own dedicated kid’s club, which is available on any day for children aged five years and older. Great pride is taken to provide well supervised, organized activities with a Polynesian twist. At Four Seasons whole families can enjoy complimentary use of paddle-boards and kayaks on a safe, shallow beach; and it's lagoonarium has a little beach for children to wade in and begin snorkeling. This luxury hotel is known for being flexible about the number of people in an overwater bungalow when the occupants are two adults with children. Families also have the option of booking an on-land villa with 2 bedrooms and bathrooms, if more space is desired. 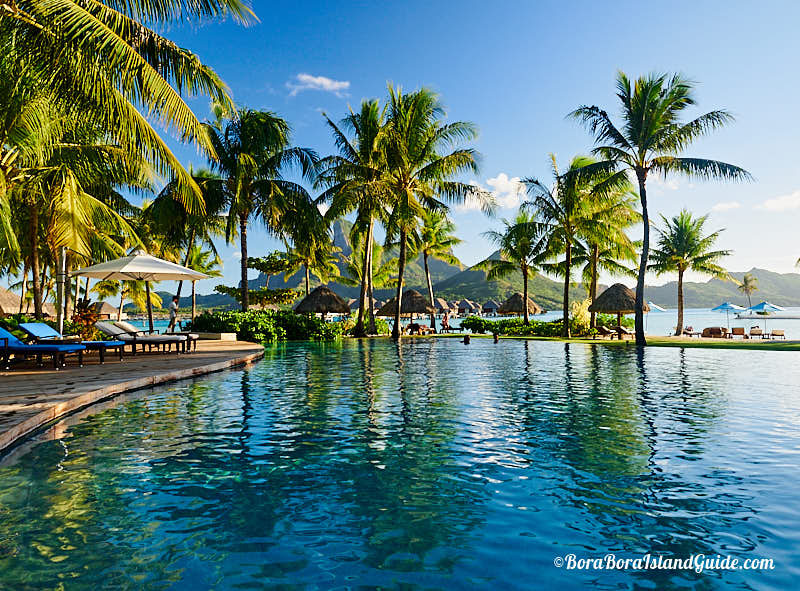 See more about why Four seasons rates as a top family friendly Bora Bora resort. The Nui – which some may remember as a Hilton – has reopened, after a complete revamp, under the Conrad name. It’s now a stunning 5 star resort that offers many complimentary activities for families to enjoy. You can play mini golf between the palms, take a kayak or paddle board out on the lagoon, enjoy a sail on a hobie cat with a skipper, or snorkel right next to the beach and around the overwater bungalows and see many colorful fish. The long sandy beach makes a perfect playground for kids and the shallow water off the beach has a smooth bottom – unlike other resorts which have some small broken coral pieces in the water. This resort is still undergoing changes. A colorful indoor children's area has been created, with play areas set up; plus a cute outside playground just a few steps from the door. Children may already use it, and soon daytime supervision will be provided. 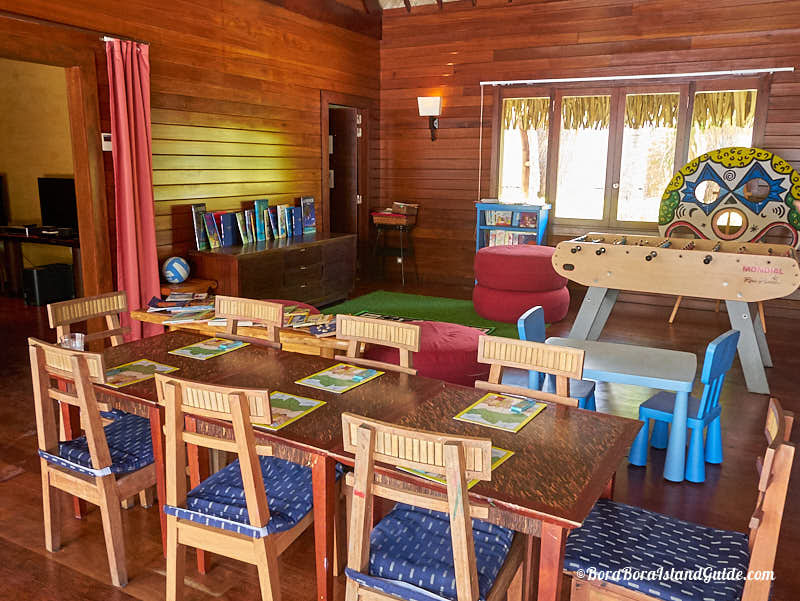 Conrad plans to offer a children’s program similar to the Four Seasons kids club and when this happens it's likely to be the best of the family friendly hotels in Bora Bora. This resort will offer a variety of garden and beach bungalows, so families can have accommodation on land if they prefer not to be over the water with young children. For those desiring more space the luxurious Presidential overwater bungalow villas provide 2 or 3 bedrooms and bathrooms to match. These are ideal for a larger family with older children as there is complete privacy between bedrooms, and completely separate recreation space. Although St Regis mostly attracts honeymoon couples they do have an unsupervised indoor children’s play room. So this resort can be considered when looking for family friendly hotels in Bora Bora. It's likely that your children will be the only ones there. The resort’s protected lagoon is the best on the island, and looking for Maeva – the resort's huge bright-turquoise napoleon fish) is likely to be your children’s favorite activity. Kids can safely enjoy riding the bicycles around the vast grounds as staff driving the small golf carts are vigilant in giving bikes and walkers the right of way. If you have a child too young to ride there are even bikes with a basket seat for your little one to sit on the back while you ride. The St Regis spacious 2 bedroom on-land reef and beach bungalows, with private pools, are great for families. 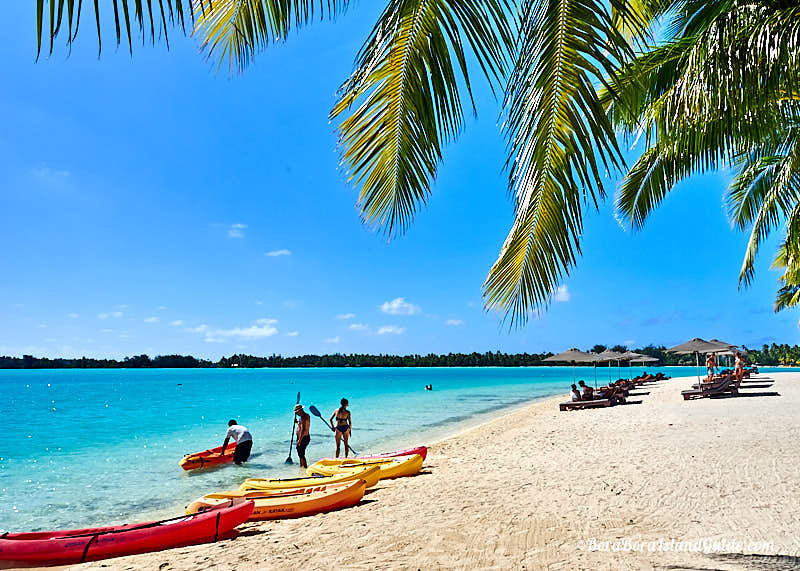 Affordable Family Friendly Hotels in Bora Bora? Those seeking moderate-priced options for family friendly hotels in Bora Bora will find Le Meridian a good choice. Although this resort is a step down in luxury from those above, the view across to Mt Otemanu – from restaurants and beach – is as good as it gets. The modern one and two bedroom beach villas are in a great location for children to play right outside the door, and they're an affordable price for having a budget vacation in Bora Bora with kids. Le Meridien Resort has two pools, a large beach, and a protected inner-lagoon that's a safe place to snorkel with kids. A highlight of a Le Meridien stay is the turtle sanctuary. Guests can learn about the turtles and swim with them too, which is an intriguing, unique activity for children of all ages. There is no kid's club at Le Meridien but babysitting can be organized; plus children’s meals, movies, and activity packs are available.